We spend plenty of time inside homes, so it's always a refreshing change of pace to enjoy some build-time outside. 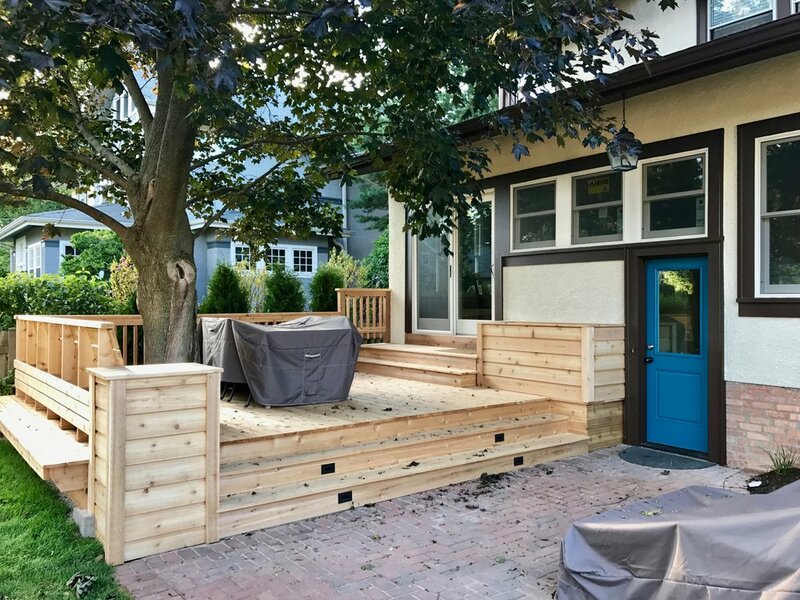 Creating a 17' x 15' custom deck for a former West-coast family makes the Summer work days even better. The backyard had one mature maple tree located 14 feet from back door, and the plans called for us to build the deck around it. The rear of the house had a number of old windows that we needed to replace. The back of the house received a face-lift with new windows, exterior lights, doors, and stucco to match the other three sides of the structure. In order to access the deck from the kitchen, we removed a bank of windows and installed a sliding door. The clients wanted room for outdoor dining, leading to a deck that extended beyond the maple tree. Our carpenter carefully scribed the cedar planks to the shape of the tree trunk (nicely done, sir!). Just beyond the tree is the 12 foot bench facing the house with built-in LED lights below. A view of the rear of the house and a second bench, this one facing the backyard. The large canopy of the maple tree provides ample shade. A view of the finished deck with all new MARVIN windows, planter box, pendant lighting, and door. The transformer for the deck lighting is hidden inside the planter box. The scale of this project almost qualifies as a mini-addition to the house, and we like the way it's connected to the paved patio and green space. It was a fun project, and we expect it will see plenty of use. We hope this family enjoys many good times with new friends on their new deck!